In the spirit of the Vancouver communityâ€™s fight to preserve the environment, the British Columbia Institute of Technology hosted the first “Green Millennium Fashion Show” during Vancouver International Fashion Week. 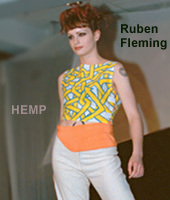 Featured were recycled and environmentally-friendly clothing, fostering the creative spirit of Kwantlen college students, hemp designer Ruben Fleming and fake fur designer April Yau. The Kwantlen students (lead by Christy Metcalfe) had invested a tremendous amount of energy in the making of the time-consuming designs, in staging the show and modeling their designs. Each of the students chose a recognized designer label like Valentino, Alexander McQueen, etc., to create similar looks using recycled jeans, plastic, metal and fibers. Although the idea behind the show is similar to Toronto’s ReVamp, the direct student involvement in the production of the show lent the event an enterprising feel. The audience was mainly composed of environmental crusaders, not necessary fashion conscious, which provided students with a fresh palette on which to test their individual fashion flare, garnering applause not usually so generously given at fashion events. Vancouver is an ideal community for this sort of event, due to the number of supporters of environmental issues. They certainly have a great natural environment to fight for. The potential for inspiration we as creative beings could derive from nature is largely untapped. Like most cities in Canada faced with global markets and economies, Vancouver aspires to meet these challenges, but without forgetting that the natural geography outside the limited concrete jungle has an impact far more connected to our planet. It looks like the spirit of young, creative professionals in Vancouver is transforming the cultural composition of the city to reflect just that. Participating designers: Genny Wong, Bev Lee Kwen, Sascha Lehto, Suzette Soloman, Shannon Jorgenson, Janeil Mackay, Katie Tetaryn, Sahnnon Fee, Christy Metcalfe, Kristi Cowan, Hiedi Owen, Tina Chee, Felix Ng, Melissa Miralles, Cindy Neilson, Charla Davley, Svea Kerkovius, Tracie Keene, Rachel Wainwright, Melissa Miralles, Arti Maharti, Jen Lundy, Edina Cowan, Debby Bulpin, Courtney Law.